Introducing Fastvein™ T&A, the latest offering from the Fastvein™ Business Suite. Leveraging potent and yet flexible Vein Recognition hardware, and layering it onto a rich and intuitive suite of reporting tools, we have created a distinct leap forward in the world of attendance and people clocking, an invaluable asset for companies and individuals alike. Why Biometric Time and Attendance? Controls labour costs by requiring staff to register in and out of workplaces, accurately recording hours worked on duty. Eliminates fraud by accurately identifying staff, preventing “buddy claiming” and unauthorised people impersonating staff members. Eliminates manual entry mistakes by automating data saving costs from mis-claiming, incorrect overtime calculations and late timesheet submissions. Eliminates card and token costs caused by loss through staff losing tokens or failure to recover on termination. 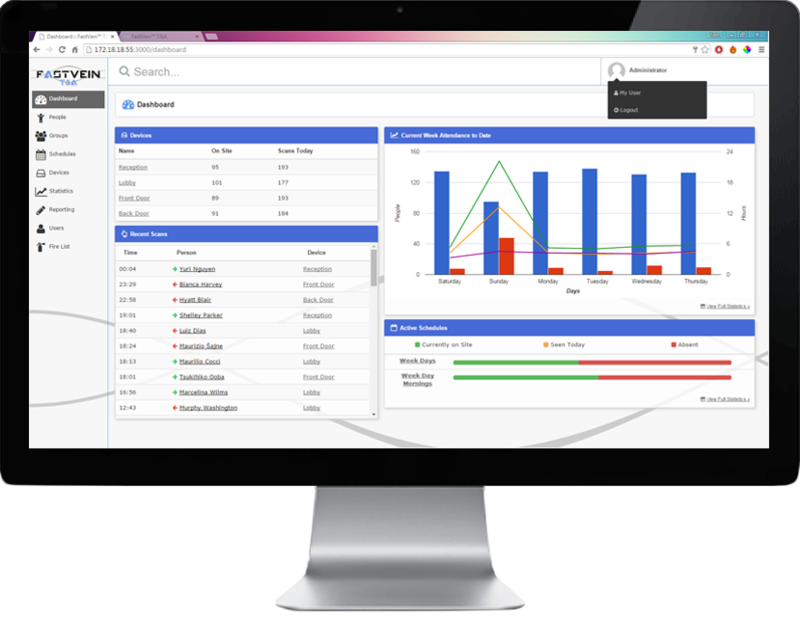 It also provides a powerful, web-based portal for information analysis and data reporting which includes data export capabilities. As attendance rates improve, productivity and efficiency improve in line. Time and Attendance systems also identify 'lost' hours; work that is paid out to employees but never completed. The case study below demonstrates the savings that one customer experienced from the accurate reporting of hours worked and attendance of staff. Payroll savings in the order of 2-3% are common. Catering for the meticulous, the detail in the reporting leaves few questioned unanswered. We spent some time with various companies listening to their Time and Attendance requirements. Some told us that they liked to keep an eye on certain individuals, others, that they wanted to boost overall punctuality and time keeping. 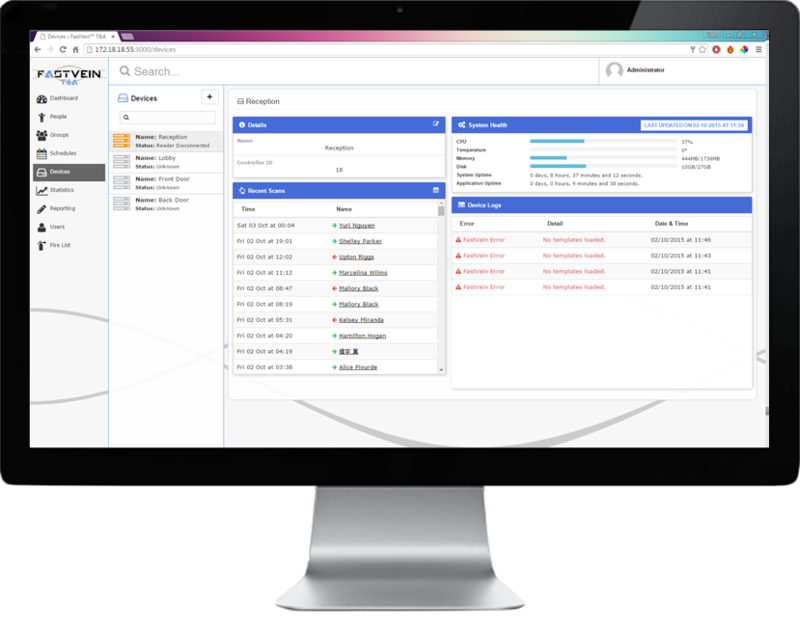 The mixed opinions and differing requirements led to what we have created; a suite of tools that leave very little information unavailable to a discerning manager. 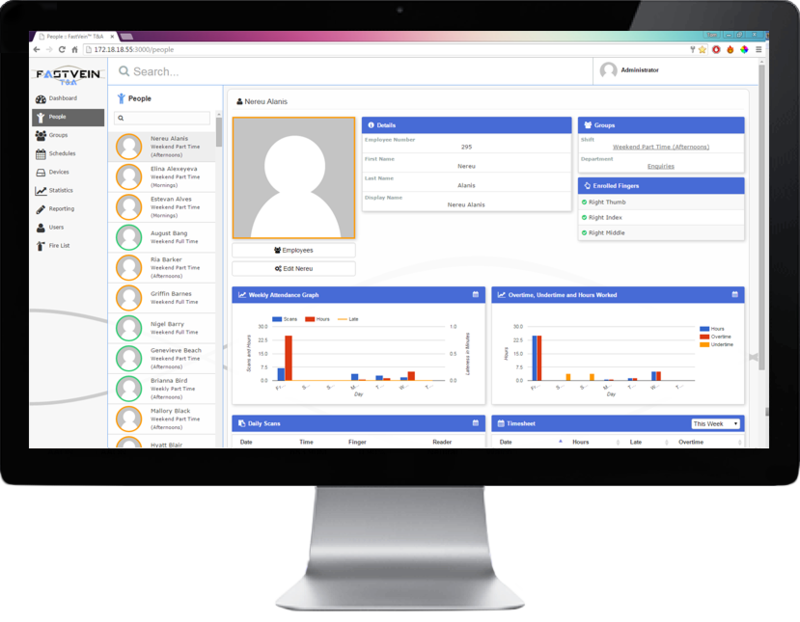 A myriad of display options and sub-category reports on individuals, offices, teams and groups. View clock-in statistics in real-time, examine overtime and under-time graphs, and in the event of an emergency, receive a real-time fire evacuation list ready for your muster points. Click any of the images above to see the interface. 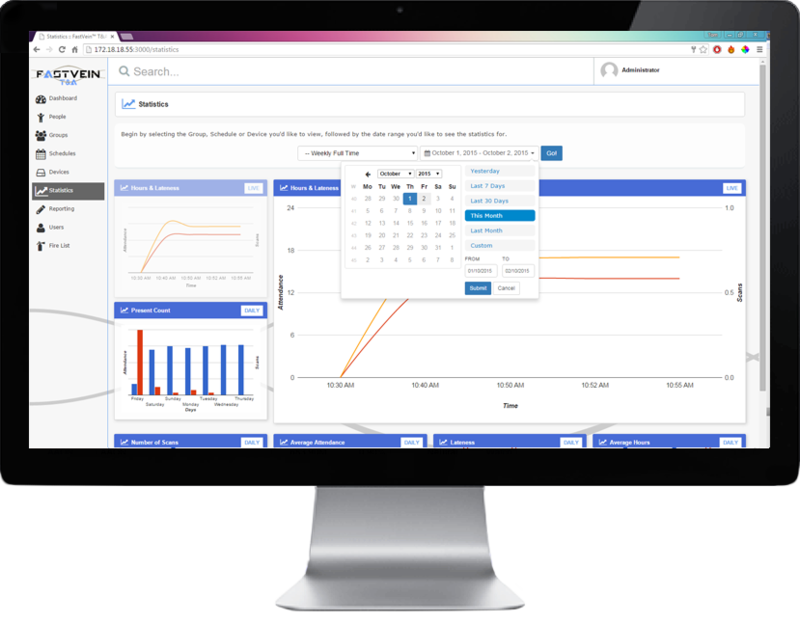 The focus of developing Fastvein™ Time and Attendance was to ensure that it seamlessly fitted in to busy executives lives, could be easily managed from almost anywhere, and would provide relevant intuitive information on a customisable dashboard. The software layout and fluidity speaks volumes. One of the largest concerns when taking on a new system or piece of technology is adapting to it and maintaining its upkeep. We have tailored the software to ensure ease of use, adaptability to user and working habits, and to make certain that Fastvein™ Time and Attendance does not intrude on day to day life. The software can swiftly be deployed on virtually any machine. The layout and navigation are intuitive and simple to use. There are an infinite number of configurations to suit your requirements; whether you need simply a single machine running the software for 25 employees, or you are trying to keep tab of a 500+ strong workforce requiring 5 interactive endpoints. Single time enrolment means even quicker deployment of the system, and from then on, you can monitor real-time reports from almost any internet enabled device. The next stage in biometric identification is here. It’s called FASTVEIN™ – and it is now the world’s leading biometric system, offering huge benefits to organisations to whom assured identity is a critical issue. 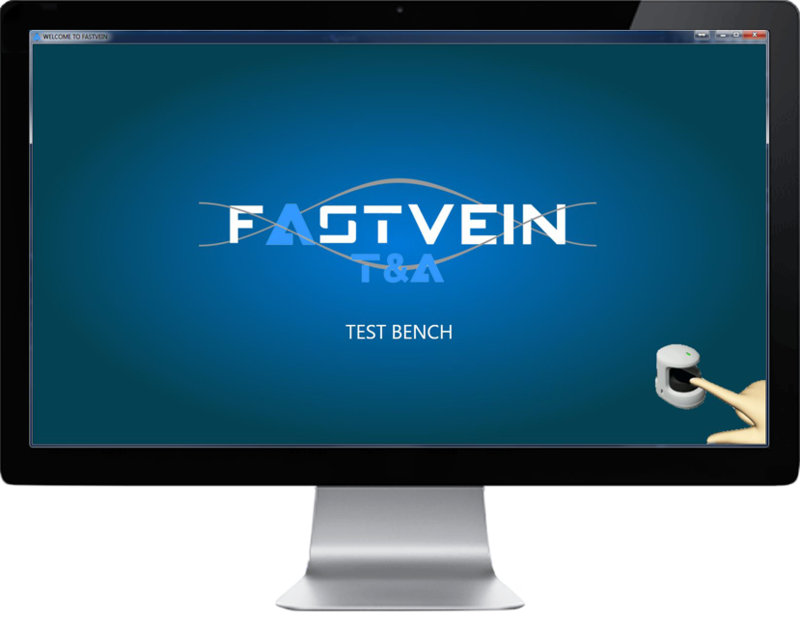 Using the latest vein identification technology, FASTVEIN™ offers ultra-high reliability and rapid recognition, and an identification standard that’s almost 35 times stronger than traditional systems. The result is a far superior biometric system – one that provides organisations with the equivalent security and accuracy of iris scanning, but at a fraction of the cost. FASTVEIN™ Time and Attendance is one of many applications of this remarkable hardware. Click on the link below to see what other applications it has. Hitachi Identity Management group provides the Finger Vein authentication technology. Croma's FASTVEIN™ team have built their own software platform that integrates with the Hitachi technology to enable people to authenticate themselves whilst simultaneously unlocking doors or gaining access to premises.